Post-wedding, I went out for lunch with my bridesmaid and fellow foodie friend, Louise. Over a spicy veggie stir-fry rice bowl (for me) & Chinese-style filled brioche buns (for Louise, both at Urban Bistro ) we caught up about everything that had happened since the wedding. We giggled and chatted and had a lovely midweek lunch, temporarily getting our minds off of work. At the end of the meal, Louise presented me with the first part of our wedding prezzie — a note! The bilingual note explained in French and English that once we arrived in Paris for our honeymoon, we were to report to the chocolate shop (Ambre et Sucre) in our neighbourhood for further instructions. Of course, this left both Mr. KitchenOperas and I delightfully curious, and we headed off to Paris with an unplanned adventure waiting for us. Once we settled in to our Parisian apartment, we went down to Ambre et Sucre, and met the delightful Corinne, who knew who we are at once! Corinne knows Mr. KitchenOperas’ family, and so she knew we were coming to visit… we were met with a warm embrace and chatted like old friends (with rusty French verb conjugations). After some chocolate truffles for fortification (the shop specializes in truffles under the KC Chocolatier mark, I highly recommend the dark chocolate filled with caramel), Corinne handed us an envelope tied with a fine red ribbon. 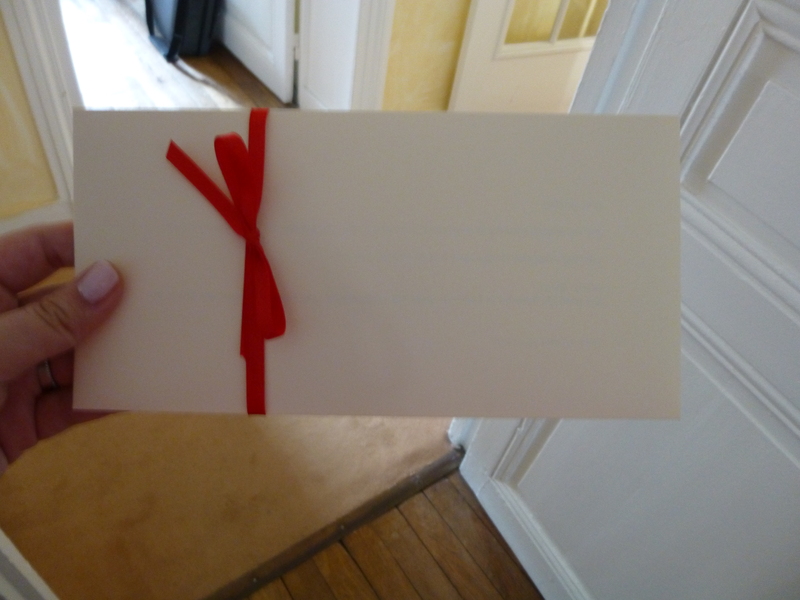 We ran up to our apartment so we could get the chocolates out of the Parisian heatwave, and to open our envelope! We were absolutely delighted to find inside a note from one of the managers at Ladurée inviting us to come for a meal to enjoy our gift certificate from Louise & her partner, “M”! Ladurée is a veritable institution in Paris. They are a pastry house (established in 1862! Don’t you just love how old everything is in Paris? ), known for their macarons — little almond meringue cookies filled with cream fillings. Macarons are naturally gluten-free as they are made with almonds and egg whites. Louise and I have made macarons together before, and so we know just how much work goes into them (here is my English recipe for Lavender Macarons with White Chocolate Lemon Ganache, and Louise’s recipe is here in French). 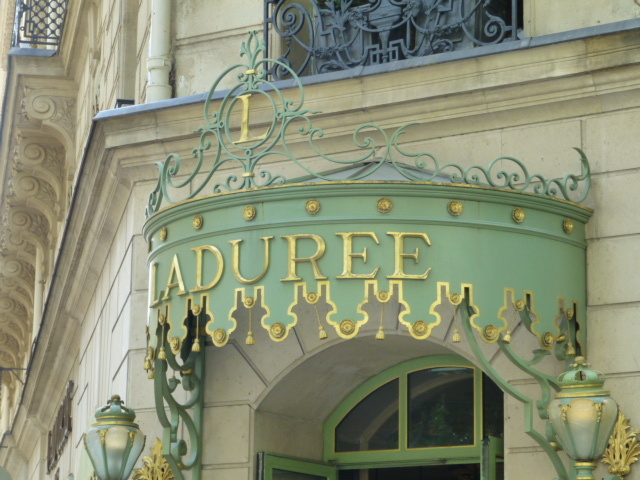 In Paris, there are two main institutions known for their macarons: Ladurée and Pierre Hermé. It was on my “Paris Bucket List” to try macarons at both houses, and Louise & M made it possible for us to enjoy a whole meal at Ladurée along with the macarons. Ladurée is serious about their macarons — even including the history of macarons on their website. 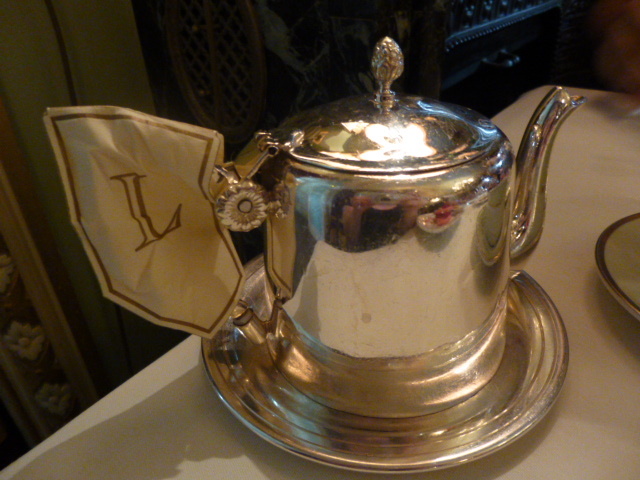 Mr. KitchenOperas and I were so excited to go to Ladurée, and for us the anticipation is a huge part of the enjoyment of a meal. So we decided to go in our second week of the trip. This was probably a good idea, as we spent our first week preparing for, spectating at, and recovering from the final stage of the Tour de France — we watched the final laps of the month-long bicycle race, as the riders zipped up and down the Champs-Élysées. As a part of finding the perfect spot for viewing the cyclists in action, we scoped out the whole length of the Avenue des Champs-Élysées. 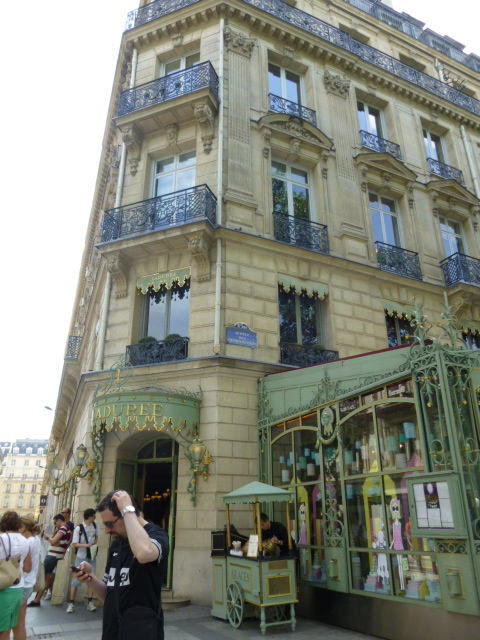 Up by the Arc de Triomphe is a Ladurée boutique, with an enticing patio right in the middle of the wide sidewalk, and a beautiful tea room inside. We scoped out the menu, and decided to come back for a full lunch. Of course, we had to get a macaron-topped ice cream for the road. 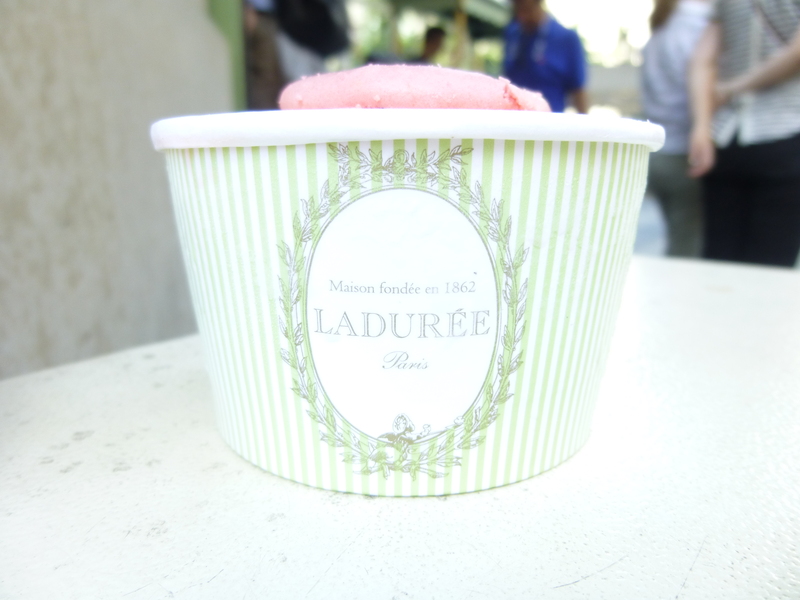 I picked the rose flavour, which had both rose ice cream and a single rose macaron shell on top. I tasted the ice cream and was immediately hit with a rush of floral taste and smell. 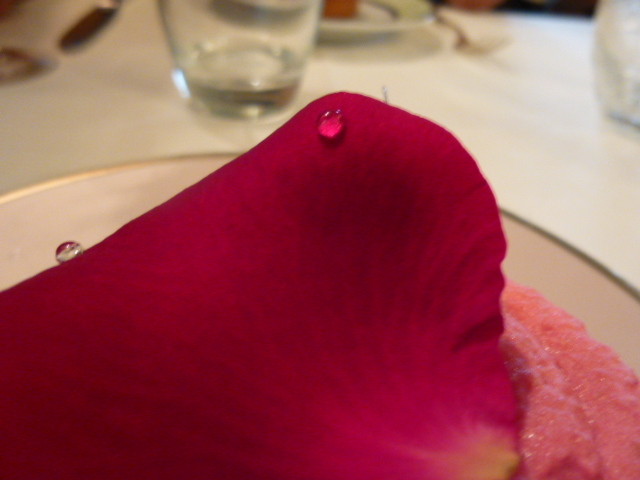 It was like every dessert I’ve ever had with rose water, distilled into the ideal form of a rose dessert. The ice cream was perfectly smooth and creamy, without a hint of graininess or iciness, which made the rose flavour feel even more decadent. The rose macaron shell on top was just as full of rose flavour, but in the meringue/cookie texture of a macaron. It had gotten a little soft from perching atop the ice cream, but it was enough of a tease for us to know that we were in for a real treat for our full meal. Back at the apartment, I spent a couple of days looking at all the macarons on the Ladurée website, as well as pouring over blog posts and comparing all the options on the menu (at Not Quite Nigella’s site), trying to decide which of the decadent desserts I would try. I couldn’t make up my mind, but knew that my lunch would be an easy choice: I’d feast upon the Omelette à la crème de truffe (omelet with truffle cream). For dessert, I was torn between several of the macaron-based desserts: pistachio macaron with pistachio mousse and berries? A rose macaron with with raspberry and lychee? The chocolate macaron chocolate zabaglione mousse? There were several options that each showcased my favourite flavours! So on our Ladurée lunch day, we walked from our apartment up to the Champs-Élysées to work up an appetite. Before we went in, I had to look at the beautiful displays of macarons in their window, and with my nose pressed up to the glass, sighed over all the gorgeous pastries. We walked through the front doors and were immediately greeted by a hostess who asked if we were there for tea or lunch. As we were there for lunch we were escorted upstairs (downstairs is a tea room), and seated at a beautiful table by an ornate gilt mirror. 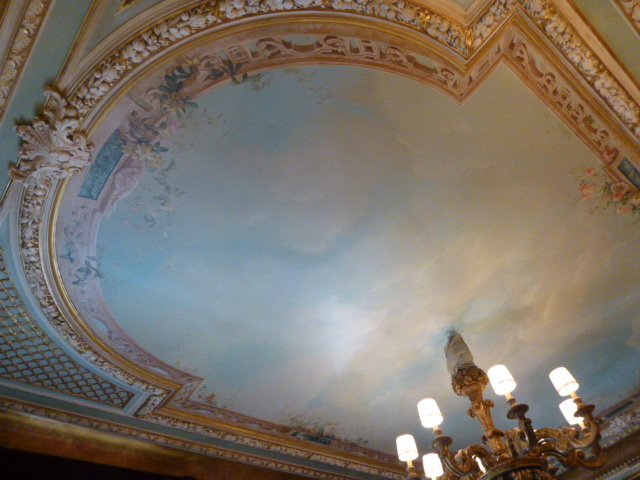 Even the mouldings on the ceiling had gold-leaf details! Seeing as we were on our Honeymoon, we thought we’d splurge on this meal. And so we ate and drank everything we wanted that afternoon. We started with Champagne Ladurée Rosé (pink champagne) — because really, why not? 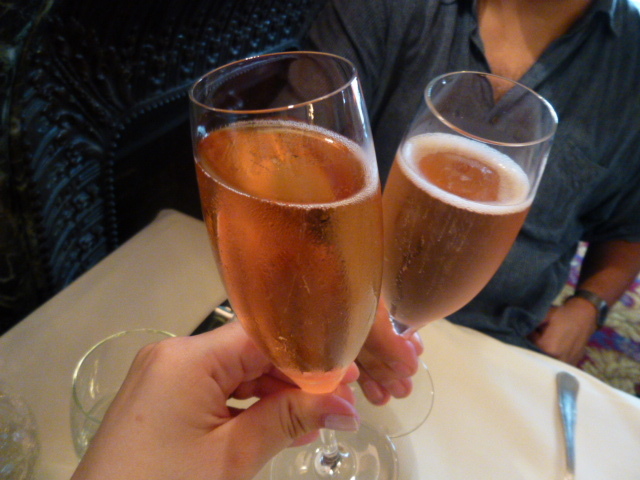 We toasted to our honeymoon, and to Louise & M for their friendship, and for making our Ladurée treat possible. Onto the menu — I knew that seeing as I’d chosen my truffle omelet, all I had to pick out was my dessert. 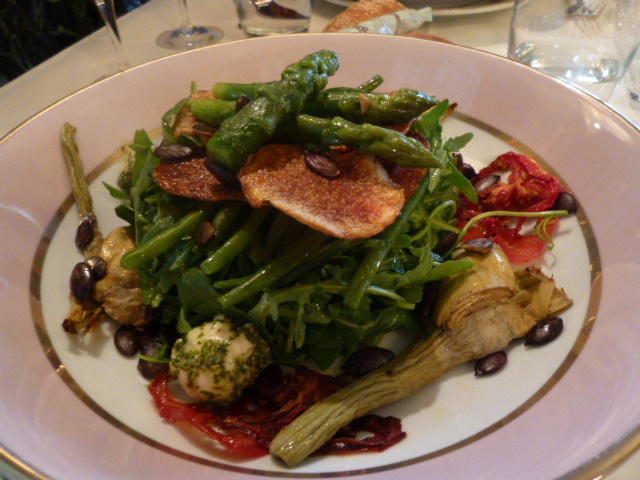 And then I saw something on the menu that made me take pause… the Salade Ladurée — “Rocket salad, small artichokes, green beans, tomatoes, green asparagus, mozzarella cheese, squash seeds, pesto, grapefruit & lemon dressing”. I think they knew I was coming and put all of my favourite things in one salad. This absolutely trumped the truffle omelet, and because it was a lighter meal I knew I’d have more room to enjoy dessert. Perfect! And I am so glad I picked the salad. Those little mozzarella balls were rolled in the pesto, and had that perfect squeaky texture that just sprang back a little bit between your teeth. On top of the mountain of arugula was tender asparagus — not crunchy but not overcooked, and sweet potato chips that provided a crunchy textural contrast to all the veggies. The dried slices of sundried tomato were sweet and were bursting with flavour. I’d have one bite of arugula with sundried tomato, then a bite of artichoke with pesto-bocconcini, and then a nibble of pumpkin seed and asparagus. Not only were the flavours each a stunning complement to the other, but all the different textures of this salad made is so much more than just a salad. The Ispahan dessert was also a dream. 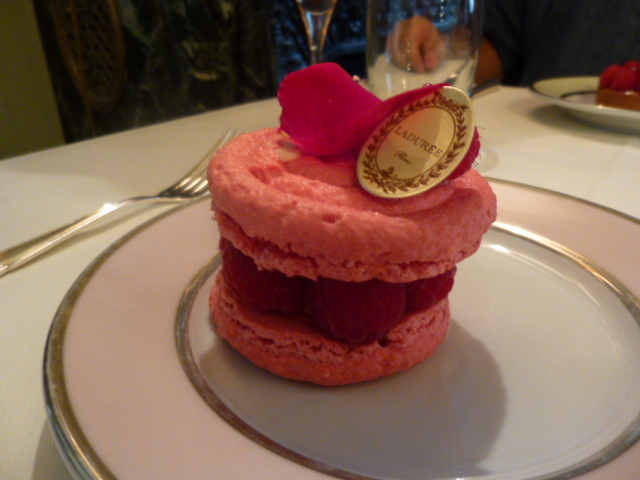 This time I got a big rose macaron (about 5cm / 2″ in diameter), filled with the rose petal cream and the fruit. The raspberries each held up perfectly. The biscuit was full of the rose flavour I had tasted in that rose ice cream on the sidewalk, but this time it had a lovely macaron texture — crisp and airy with a little bit of chewiness in the centre. Softer than a meringue, because of the almonds, but just as light and airy. And every good dessert needs to end with a pot of tea. I chose the Thé Mélange Spécial Ladurée (Ladurée Special Blend Tea) – black tea: “delicate blend of citrus fruit, rose, vanilla and cinnamon tea”. I normally choose decaffeinated drinks, but this was a special occasion, and I am so glad I tried this tea. I can still taste all of the flavours — none of them strong enough to be picked out individually, but all together making a really special black tea that made me feel like royalty. And with my dessert, I guiltily asked our attentive waitress if I could also have an extra treat… I wanted just one mini macaron so Mr. KitchenOperas and I could try the Ladurée macaron experience. She of course said that it would be no problem, and asked which flavour I wanted. I answered without hesitation that I needed a Caramel au Beurre Salé (salted caramel) mini macaron, and she responded with a wink that it was her favourite flavour too. A sign of a good macaron is that each shell has a protruding, ruffled bottom edge, known as its “feet”. The feet on these macarons were perfect, and the salted caramel flavour was rich and creamy, buttery and salty, and sweet but with that slightly “burnt” edge. A perfect little nibble to round of our exquisite meal. Ahhhh, Ladurée. We will never forget our honeymoon treat. Thanks, Monika! Maybe it can inspire a future trip of food, fun and frivolity? Such a cute narrative, I feel like I’m walking in your steps in Paris plus that mysterious note was a great one! I’m so glad that you had a wonderful time there, Paris is simply the best romantic place to be around for your big day! 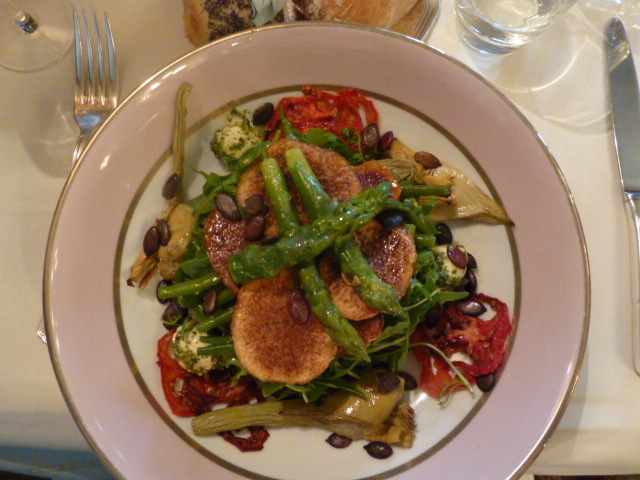 I simply can’t wait to go crazy in Paris and eat all the vegan foods! Amazing story and pictures! I’m going to be in Paris in two weeks – and now I can’t wait! ENJOY your time in Paris!!!!!! 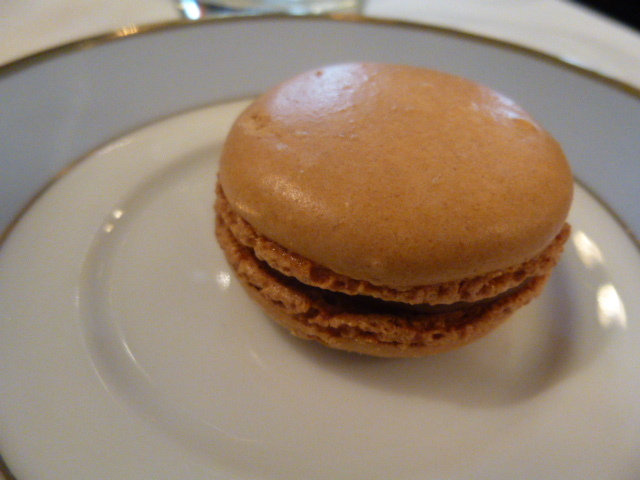 Have a salted caramel macaron for me!